The Meany PTSA is recruiting now for board and committee members for next year. We are especially looking for parents who are newer to the school, or even incoming parents, to participate. If you have some PTA experience that is great, but not necessary! We have a healthy number of current board members interested in returning to the board next year who can show you the ropes. If you are interested or would like more information – please contact us. Our Yearbook Club is is hard at work putting together a fantastic product for students and families. We are still in need of many, MANY more photos. If you have any photos of Meany students inside or outside of school, please send them to the yearbook club. You can upload your photos here or by using the hjeshare app on your phone. Use school code 7181 for Meany. The deadline is March 31st, so get those photos in today! Meany Librarian Mrs. Vester is in need of some parents who are able to help transport students to and from the Global Reading Challenge competition on the evening of April 4th at Denny Middle School in West Seattle. If you are planning to drive your own student and have room for other students, your assistance would be very much appreciated. Please contact Mrs. Vester if you can help. Excitement is building about our upcoming spring musical, The Lion King. The construction of the stage ramp is nearly finished. Big thank you to parents John Haralson and Jeff Watson for donating their time to construct it! Costumes are an ongoing project, and help is most welcome. Mr. Finney is also hoping to borrow some cd players to use for rehearsals and also a router that can help with the sound in the production. Please contact Mr. Finney if you can help with any of these things. Stop in at rehearsal some Tuesday or Thursday after school, and join in the fun! Please join us next Wednesday, March 27th at 7:00 pm in the Meany Gym for a fabulous evening of musical entertainment featuring all of Meany’s band ensembles (Cadet Band, Senior Band, and Jazz Band) as well as Meany’s BWB Drumline. There will be a separate performance the following week on Tuesday, April 2nd at 7:00 pm in the Gym featuring Meany's orchestra ensembles (Cadet Orchestra and Senior Orchestra) joined by student musicians from some of Meany’s feeder elementary schools. It should be a lot of fun! We need volunteers to assist on both evenings — supervising students, running the video camera, and collecting donations at the door. Please contact Mr. Mosgrave if you can help. Meany and Washington Middle Schools are proud to team up again this year for an 8th grade Family Night. The event will be at Meany Middle School, on Wednesday April 24th from 5:30-7:30. There will be a FREE catered dinner and FREE childcare! We can't wait to see you and help you and your student with the transition to high school. See the Flyer. 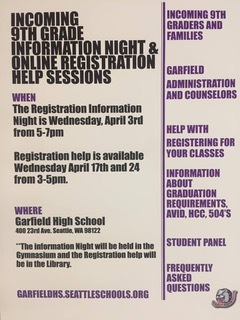 The Garfield High School Counseling Department and Administration would like to invite 8th grade students and families to come to an Information Night and Online Registration Help Sessions during the Month of April. Incoming 9th grade registration packets will be mailed out on April 8th. All registration materials will also be available on the Garfield Counseling page. Here is the Garfield High School Registration Guide & Course Descriptions for 2019-2020. Seattle Public Schools is pleased to showcase our Option Schools with Continuous Enrollment at our first annual Option high school fair, exclusive to high school students looking for something more than a traditional high school. 3:00-5:00 pm in the Garfield Library. Come and learn about the variety of programs, smaller classroom sizes, flexible schedules, and unique learning methods tailored for each student’s personality and learning style to achieve success. Questions? Contact the Office of Admissions at 206-252-0760. PARKOUR – RUN, JUMP, CLIMB! For teens in 6th, 7th and 8th grade. There are very limited spots available for this Teen Fun Wednesday Program. Registration will be open, via phone 206-684-4753 or email millercommunitycenter@seattle.gov beginning 12:00 pm, Friday April 5th. It is FREE! See Flyer for details. COOKING WITH SEATTLE CUCINA! Also a part of the free Teen Fun Wednesday Program, teens will have the opportunity to learn their way around the kitchen in this class.There is very limited space in this course. Registration will be open, via phone 206-684-4753 or email (millercommunitycenter@seattle.gov) beginning 12:00 pm, Friday April 5th. It is FREE! See Flyer for details. FREE GUITAR LESSONS! This course teaches teens how to play guitar – and what’s more, after attending all 8 weeks you have the opportunity to own your guitar. There is very limited space in this course. Registration is already open: online, via phone 206-684-4753, or email (millercommunitycenter@seattle.gov). It is FREE in conjunction with the nonprofit GuitarsNotGuns. See Flyer for details. Additional activities/days/times are posted on our Facebook page on Mondays. - Summer camp registration has officially opened, and this year there are additional camps specifically for teens! Some great Specialty Camps to be aware of: Cooking Camps, Racket Sports, Comic Book Camps, Tech KnowHow and Java, Parkour, and the Mad Science camps. - Reminder that 2019-2020 Scholarships are now available. Now is the time to start the application process. Download the Scholarship Application and Scholarship Instructions. - NEW: Teen Drop-In times! We will have a dedicated space for teens 1:00-4:00 pm Monday through Friday this summer for free drop-in.